London, Ontario artist Tom Benner has maintained a consistent but endlessly creative focus on Canadian icons across his oeuvre. Primarily, these icons originate in the natural world: they include wolves, beavers, and bison, white cod and the white pine. 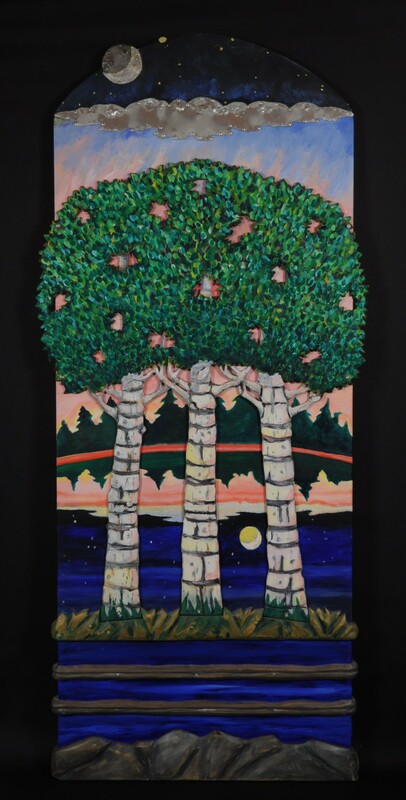 Birch (2003) shares with Benner’s other works another Canadian symbol: the birch tree, so essential to Aboriginal populations and frequently captured on early 20th-century canvases by Tom Thomson and the Group of Seven. Benner’s birch is highly unusual, however. Stylized and flattened, it resembles the topiary-like trees of Henri Rousseau’s Parisian scenes and shares with Rousseau a dreamlike, almost magical quality. Benner also disorients viewers by echoing the pattern of the clouds in the rocks at the bottom of his work and by doubling the moon in an improbable reversal of sky and reflection. In doing so, he creates a natural scene that is highly unnatural, more symbolic than representational. Whether this birch is a neo-biblical Tree of Life or a reinvented Canadian emblem is up to the viewer to decide—and reimagine. Benner uses a wide variety of materials to transform the living world into art—from cold-rolled steel and nails to wood, paper, and printing ink. Viewers are conscious of the manual labour involved in each work’s creation, for Benner’s sculptures, prints and installations reject any definition of the artist as a detached and anonymous “architect.” They assert the skill of their creator as well as the personal vision that engendered them.